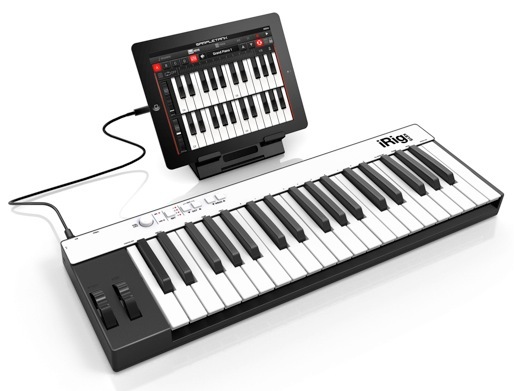 IK Multimedia has two new exciting products for mobile musicians: iRig KEYS PRO & iRig KEYS with Lightning connector, compact MIDI keyboard controllers with 37 velocity-sensitive keys. iRig KEYS PRO includes both a Lightning-connector and 30-pin cables for plugging directly into the dock connector of any iPhone, iPad or iPod touch as well as a USB cable for direct Mac or PC connection. Core MIDI support provides the ability to play any compatible virtual instrument or recording APP on an iOS device or computer using Apple GarageBand or IK’s SampleTank. No AC adapter or batteries are needed to use iRig KEYS PRO since the power is bus powered. iRig KEYS PRO allows the battery on the mobile device to be conserved by featuring an auxiliary mini-USB port to provide it with power during performance. With powerful programming features that are useful during both live performance and in the studio, musicians can program iRig KEYS PRO with different set-ups and store them in one of the 4 “Set” banks. When iRig KEYS PRO is in Edit mode, the user can set the MIDI transmit channel, velocity response, assign Control Change numbers to the Volume/Data knob, send custom Program Change messages, transpose the keyboard in semi-tones and more. iRig KEYS PRO also sports an expansion jack for adding an optional sustain pedal for a realistic piano feel, or an expression pedal that sends MIDI continuous controller data that can control parameters such as volume, rotary speaker speed, tremolo and vibrato speed and more, on the connected app or software instrument. Tool for musicians – complete music production. iRig KEYS PRO is great for the recording studio as it works GarageBand, Logic Pro and other DAW software packages. It’s also suitable for controlling virtual instrument plug-ins such as IK’s SampleTank, Sonik Synth, SampleMoog™, SampleTron and Miroslav Philharmonik. For Mac/PC use, iRig KEYS PRO comes with SampleTank 2L (Register and download on the IK Multimedia online User Area). iRig KEYS with Lightning connector is IK’s new version of the ultra popular iRig KEYS portable mini keyboard but now includes a Lightning-connector cable for connecting iRig KEYS to the newest Apple devices: the new iPad, iPad mini and iPhone 5 series. Sharing the same powerful features of iRig KEYS PRO, iRig KEYS with Lightning connector is a more compact design therefore taking up less space on the desktop as well as being a better fit in a backpack. December 3, 2013 in Music production.